Want to Learn to Speak Pilish? It's a trick question. Pilish is not really a language but a form. Pilish is any text that incorporates words that match the digits of pi. There are poems in Pilish, novellas in Pilish, and translations into Pilish. Check out an excerpt from The Raven. 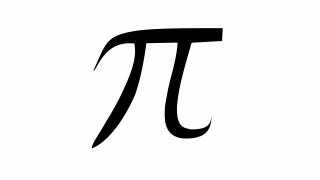 The digits of pi are as follows: 3.14159265358979323846264338327950288419 . . . It just goes on forever, meaning that the language of Pilish need not be constrained - other than in the obvious way. Pilish simply means writing a novel in which each word matches its letters to its corresponding digit of pi. The first word has to have three letters, the second word has to have one letter, the third word has to have four letters, and so on. How long can Pilish last? Michael Keith wrote a 10,000-word novella, Not A Wake, in Pilish. He has also translated original works into Pilish. His translation of The Raven, by Edgar Allan Poe, is very good. Please note that the title is part of the Pilish. As for accidental Pilish, Nick Fitzgerald scanned Project Gutenberg and found only a smattering of Pilish among the texts. The longest phrases in Pilish were eight words long. The best of these was from Captain Cook's journal, when he wrote, "And I have a great Objection to firing with powder only amongst People who know not the difference, for by this they would learn to despise fire Arms and think their own Arms superior, and if ever such an Opinion prevailed they would certainly attack you, the Event of which might prove as unfavorable to you as them." The first eight words are Pilish. I wonder what would happen if someone made the effort to speak in Pilish. Since the first digit, 3, corresponds with "yes," they would probably find themselves acceding to many things without making any further comment.